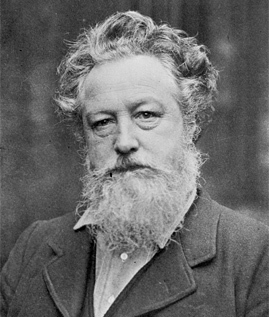 This exhibition offers an unprecedented opportunity to explore the many faces of the designer, craftsman, retailer, poet, and social agitator William Morris (1834-1896), as well as those of the main figures in the Arts and Crafts movement. This new generation of architects, designers, artists and craftsmen, shared a passionate concern for the harmful effects of industrialization on society, working conditions and traditional British crafts. The movement promoted the widespread revival of handicrafts, honest, simple construction, and high quality materials, as both a philosophy for production and as a means of decorating the home. It also believed strongly in the attractions of the simple life and living close to nature. The questions that the movement raised about sustainable production, the balance between work and life, truth to materials, the beauty of the everyday object, and the preservation of historical buildings and the environment continue to resonate to this day. The show is organized in four chronological and thematic sections which feature 300 emblematic works, including furniture, textiles, wallpapers, jewellery, glass, ceramics, metalwork, book bindings, paintings, drawings, prints, and photographs. The first section is devoted to the Origins to Red House (1834-1860) with works by A.W.N. Pugin, John Ruskin, and other figures associated with the Gothic Revival. It also features works by members of the Pre-Raphaelite Brotherhood such as D. G. Rossetti and E. Burne-Jones. 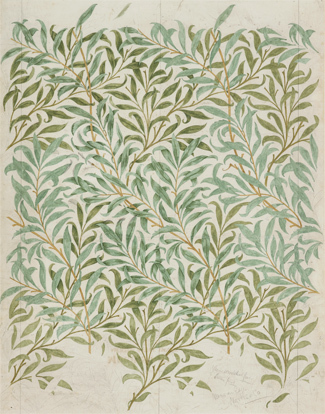 The second section, William Morris and Company (1861-1896) is focused on objects produced and sold by the Morris company with an exploration of how they were made. Attention will also be drawn to Morris's commitment to conservation and socialism, and to the work of his printing house, the Kelmscott Press. A third section reviews The Arts and Crafts Movement in Britain (1887-1914), with works by C.R. Ashbee, M.H. Baillie Scott, Sidney Barnsley, W. Crane, E. Gimson, W.R. Lethaby, C. R. and M. M. Mackintosh, C.F.A. Voysey, P. Webb, and commercial suppliers such as Liberty and Heal's. The last section is dedicated to the The Spread of the Arts and Crafts Movement (1890-1914), with pieces that illustrate the connections between the British movement and its development in countries such as Germany, Austria, The Netherlands, Finland, Sweden, Norway, Denmark, Spain and USA. Star objects include a vast hand-woven tapestry illustrating the legend of the Quest for the Holy Grail made by Morris & Co in the 1890s, an exquisite cabinet painted with images of rural life by Ernest Gimson, beautiful embroidery panels by Margaret Macdonald Mackintosh, and a large stained glass window by Frank Lloyd Wright. Almost all the works in the exhibition have never been seen in Spain before. A travelling exhibition, the Museu Nacional d'Art de Catalunya in Barcelona will host the show from 22 February to 21 May 2018.